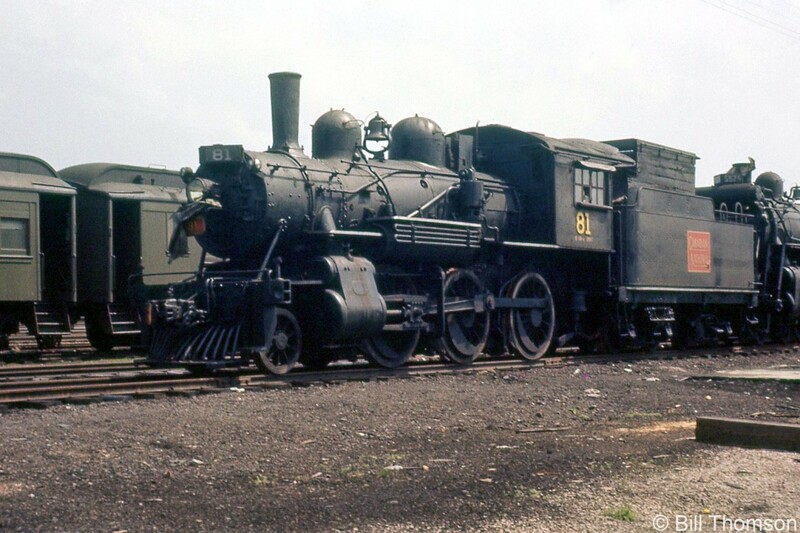 Railpictures.ca - Bill Thomson Photo: With her career of working branchline assignments in the area at an end, Canadian Nantional 81 sits in the deadline with other steam engines in the yard at Palmerston in 1958, near the end of the steam era. An E10a class 2-6-0 “Mogul” built by CLC in 1910 for the Grand Trunk Railway, 81 would be donated to the City of Palmerston ON in 1959 and put on display, where she can still be found today. | Railpictures.ca – Canadian Railway Photography – photographie ferroviaire Canadienne. Caption: With her career of working branchline assignments in the area at an end, Canadian Nantional 81 sits in the deadline with other steam engines in the yard at Palmerston in 1958, near the end of the steam era. An E10a class 2-6-0 "Mogul" built by CLC in 1910 for the Grand Trunk Railway, 81 would be donated to the City of Palmerston ON in 1959 and put on display, where she can still be found today. Stuffed and mounted in the open, but recent photos in the last few years showed fresh paint. Is she in good condition? Protected? Greased, oiled, and painted?